The Sangoma A104 board: Four spans of optimized voice and data over T1, E1, and J1 lines. This 4 port PRI Digital card supports up to 120 voice calls or 8.192 Mbps of full–duplex data throughput over four T1, E1, or J1 lines. 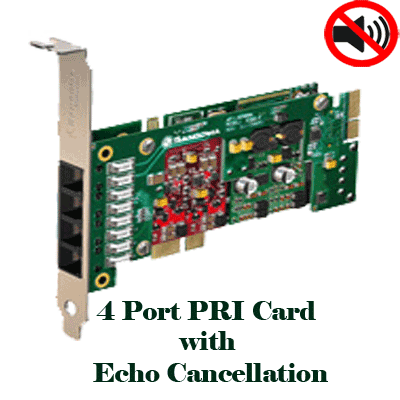 The 4 port pri digital card is equipped with world class DSP hardware to achieve carrier-grade Echo Cancellation and Voice Quality Enhancement functions for your telephone systems.